Colorful Rainbow Mermaid Melissa at Live Pool Events & Resort Pool Parties. 10/04/15 New bonus videos and article from Fortune Magazine listed below! 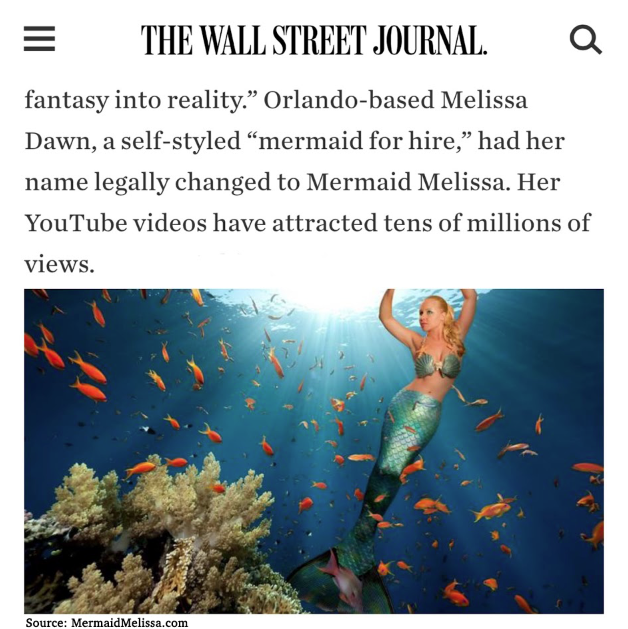 Mermaid Melissa is so dedicated to her lifestyle that “Mermaid Melissa” is her actual, legal name. Her previous work experience includes such jobs as trainer for underwater entertainers, marine mammal trainer and lifeguard, so her work today comes as little surprise. “I have been called a mermaid for most of my life, because of my strong swimming skills and love for the ocean,” she said. She wouldn’t disclose her rates, but she said that her work involves a lot of moving parts and a lot of travel, which she admitted doesn’t come cheap. She said that the downside to the job, apart from the physical demands, is the strong possibility of getting sick from spending whole days in cold water. However, she preferred to focus on the positive aspects. As squealing pre-teen girls gather before a large tank at a Florida aquatic park, Mermaid Melissa wriggles into a 60-pound silicone tail and a clamshell bra. Backstage, Mermaid Melissa nods to her production team, then, with the free-flowing finesse of a sea creature, careens into the water. Slowly and gracefully, she glides 14 feet below the surface; here, she’ll hold her breath for 5 minutes while doing tricks for the crowd on the other side of the glass. With platinum blonde hair and blue eyes, Melissa looks more like a Barbie doll than Ariel. 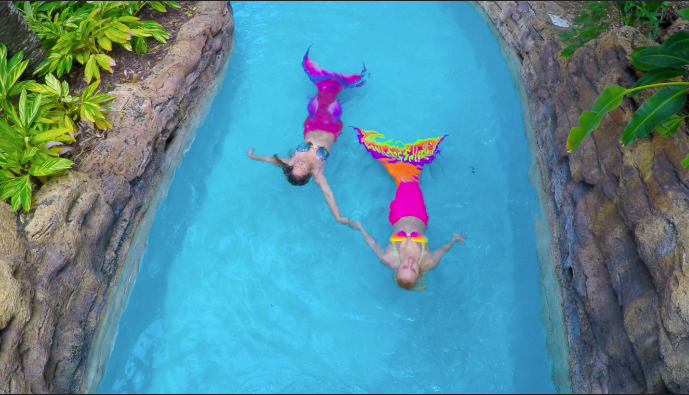 But for more than a decade, she has made a living in one of America’s strangest trades: the “professional mermaid” business. 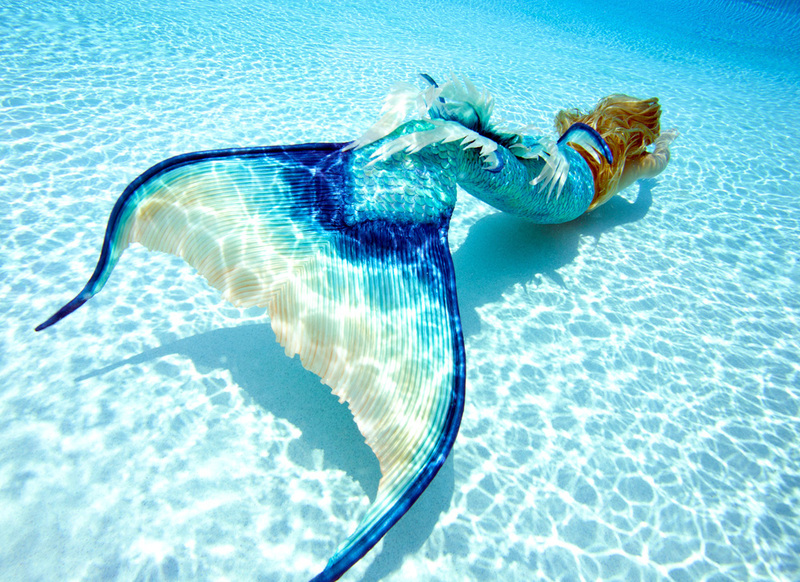 The life of a mermaid, especially one who makes a living at her craft, is not for the weak-willed. It is a job that requires synchronous expertise in freediving, swimming, marine biology, and CPR — not to mention a superior level of physical fitness and core strength. With nearly a decade of experience as a professional freediver and underwater performer, Melissa fits the bill. 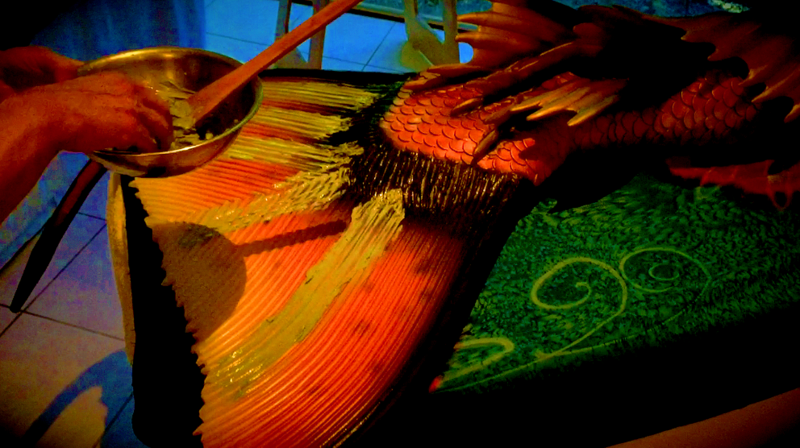 But she is also a consummate entrepreneur who has built a thriving business around her mermaid alter-ego. In her early teens, Melissa moved with her family to Orlando, and, for the first time, the shy, quiet animal lover “came out of [her] shell.” With dreams of someday working with Atlantic bottlenose dolphins, she secured a weekend job as a show attendant in the sea creature stadium; by 16, she’d worked her way up to part-time cage cleaner, and by 18, she was tasked with directly helping the performers. 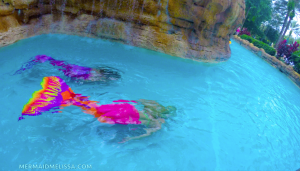 Eventually, she graduated college with a marine biology degree, became a certified freediver, and was hired by “the largest marine life park in Orlando” to be an underwater performer. 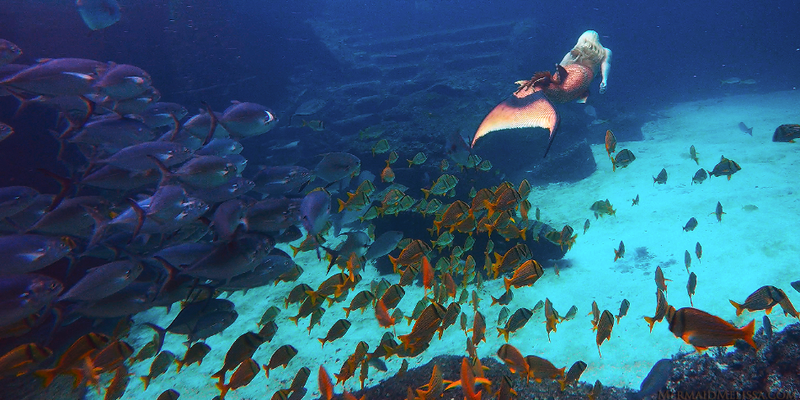 For 8 to 12 hours a day, she swam in large aquatic tanks, entertaining thousands of tourists. It was a job that required a unique blend of advanced swimming skill, technical diving know-how, endurance, and extreme breath-holding. Renowned for her breath-holding and underwater tricks, the venue began announcing her to the crowds as “Mermaid Melissa.” It wasn’t before long that audience members began to ask her where her tail was. Yet after dozens of inquires about her lack of a tail, Melissa realized it was time to suit up; when she did, she figured she’d also spread her new brand name outside of the confines of the Universal theme park. 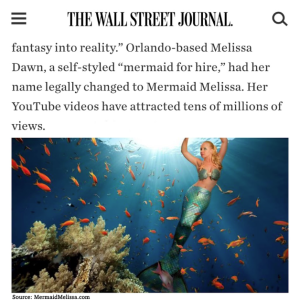 After a few of her videos went viral, Melissa posted a promotion offering her services as “mermaid for hire” at children’s birthday pool parties. 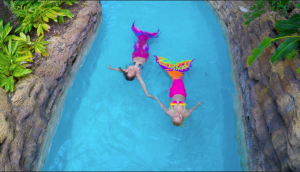 The ad generated so much interest that she decided to launch her own professional mermaid service company. 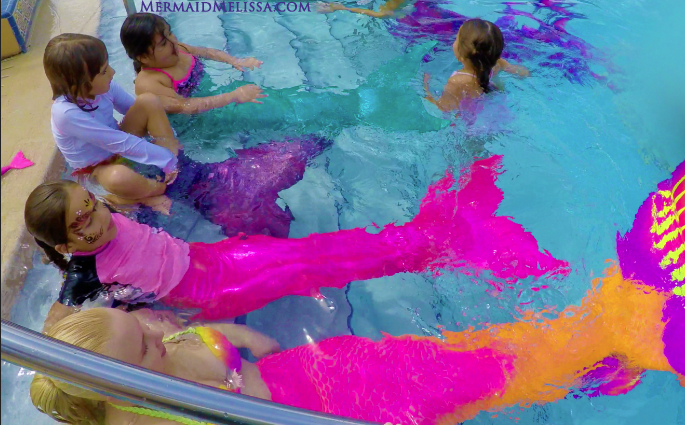 Since 2007, Melissa has run her own mermaid mini-empire. What started as her offering to perform at children’s’ parties has since expanded into a fully-staffed “mermaiding troupe” that puts on shows all over the world, and an arsenal of five custom-made mermaid performance tanks that are rented out frequently for private parties. 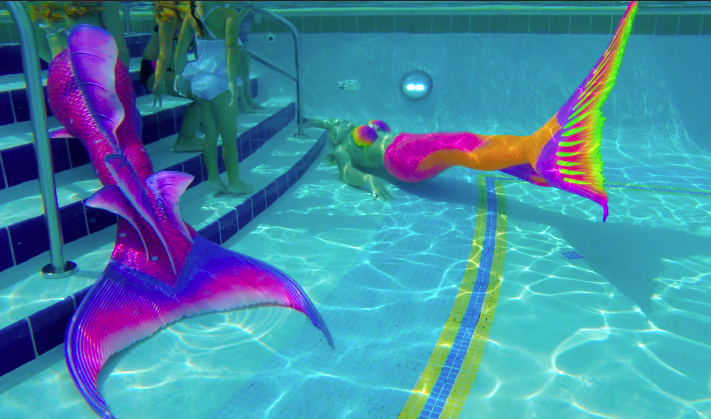 And who exactly hires a troupe of mermaids? 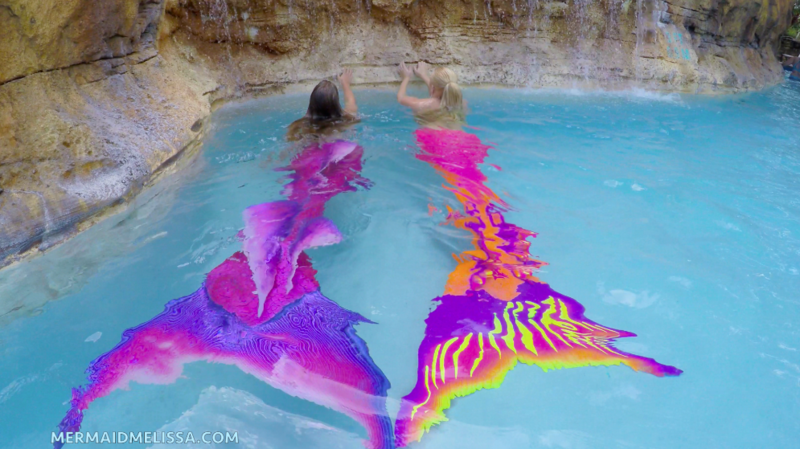 In the past few years alone, Melissa and her mer-crew have been hired by aquariums, hotels, resorts, movie directors, event planners, corporate companies, photographers, charities, reality shows, fairs, concerts, fashion designers, and corporate events — just to name a few. She’s worked every type of event, from lavish VIP parties to Hollywood movie shoots, and her work has taken her across the world: Japan, Dubai, Australia, Germany, the Bahamas, Italy, Belgium, France, London, Portugal, Jamaica…the list is exhaustive. Melissa has managed to build out an impressive online fan base: her 134,000 YouTube followers has earned her a YouTube silver play button award (her channel has over 160,000,000 views), and her 600,000+ Facebook fans provide her with an endless stream of business. “I guess I just decided to take it to a whole different level than they ever imagined,” she admits. Her company’s slogan — “Let’s help save the oceans before all creatures become mythical” — voices her vision: a world focused on protecting and saving the sea and its dignified creatures. In a roundabout way, it’s a message that harkens back to her dream as a child.